Installation of a new floor in upper loft area. A very tidy job. Everything was completed on time with every care taken around the house. Will engage again. I was very pleased with the standard of service I received from Access4Lofts. Pete, who carried out the work, was punctual and meticulous in his preparation protecting carpets from work dust and debris. All the work was carried out in a quiet, efficient manner with a high standard of workmanship. At the conclusion of the work the area was hoovered leaving it in a clean and tidy condition. I would certainly recommend their services. Well pleased. Very pleased with the work. Arrived on time, worked very hard under difficult conditions in a very hot and small loft. Very neat with no mess. Also very kindly helped me put boxes in loft which was very much appreciated. I would certainly recommend. Arrived on time both days, worked hard. As per quote part boarded loft space, fitted new hatch and loft ladder. Completed work was very satisfactory with no hidden extras. Left work area clean and tidy. Pete sent a quote for 40 sq. m of loft boarding and readily agreed to halve it in size and cost to help me. He kept to his time schedule and was prompt, efficient and friendly throughout. Due to his advice, in fact, we ended up paying over 25% less than quoted, a great present for Christmas! We recommend him with out question! Andrew, East Sussex – Loft Boarding , Insulation. An excellent service was provided by Pete. He was very tidy when installing our loft ladder and we would definitely recommend him to others. Thank you. Fantastic job. Very professional and clean / tidy. Job done within the agreed time. We are very impressed with the work carried out and could not recommend anybody else ! Pete gave us a clear quote which he stuck to, even when we slightly adjusted our requirements. Work was completed to a high standard with everything left clean and tidy both during and after. Very pleased with the results. We’ve intended to do this for years but never got around to it. From initial enquiry, to fitting, was about ten days – very speedy service and excellent quality. Thank you. Prompt, efficient, friendly and conscientious. Very pleased with the job done and would definitely recommend. Many thanks. Pete, just wanted to say thank you for the superb job you have done with our loft. We are very pleased. I was very impressed with the service I received. The workers turned up on time for both the estimate and to carry out the work. They were polite, friendly and tidy. They explained the functions and safety features clearly and made sure I understood them. I would definitely recommend Access4Lofts to family and friends. We had a new hatch and loft ladder fitted by Access4Lofts. The service from start to finish was a 5 star one. When Pete left you would not know anybody had been working there as it was left so clean and tidy. We would recommend him to any of our family and friends. Very professional service. Pete was extremely polite which is very refreshing. We hardly knew he was here. Minimal mess and disruption. In fact our landing and stairs carpet were cleaner after he had been than before. Excellent service. Pete has been a delight. He was punctual, respectful, quiet, tidy and neat. The loft work is amazing. I am thrilled. Pete arrived on time for measuring up and emailed me a detailed quotation later the same day. Once I had accepted the quotation (which was exactly that and not an “estimate”) a date was fixed for installation. Pete arrived on time for the installation and installed boarding to the loft, a replacement loft ladder and a new insulated hatch cover which was made to measure. Pete ensured that all carpets leading to the loft area were covered and any minor dust was vacuumed up before he left. The job was finished within the timescale indicated, at the exact price quoted and to a very high standard. I have absolutely no hesitation in recommending Pete and his company to everybody. I would highly recommend this company to work on your home. I had an area of my loft boarded and insulated. It was so well done that I have requested for a further area to be completed to make a safe and usable storage space. Pete was hard working, polite and cleaned up afterwards. Five stars. Pete came to install a loft ladder and board a small area in the loft. He did an excellent job, was clean and tidy and arrived on time. Part boarding of loft for storage, very punctual and professional. Job was really well done. We are very pleased, would recommend Pete without a doubt. Communication was also first class before and after the work was completed. Very pleased with the process from start to finish. Very professional. All stair and landing carpets were covered before work commenced. Everything left clean and tidy. Knowledgeable and friendly. Would not hesitate to recommend. 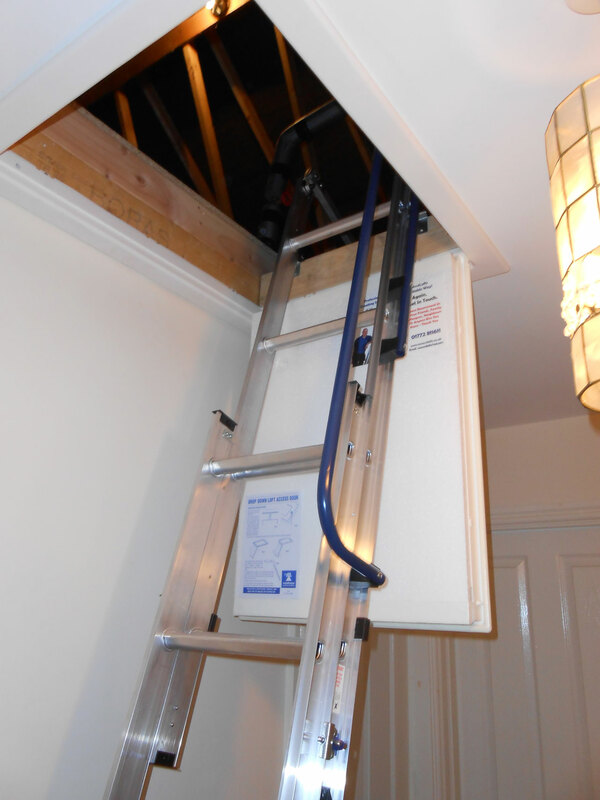 The loft ladder was installed efficiently and with minimum fuss. The stairs and landing were covered during installation and completely tidied up before leaving. We are very pleased with the loft ladder and how you left everything so clean and tidy. We would have no hesitation in recommending you in the future. A very professional job. Clean and tidy and work completed on agreed day and time. I would be very pleased to recommend. Access4Lofts did an excellent job. They were extremely competent, courteous and considerate, and worked to a high standard. The job was efficiently completed in one day. They were meticulous when tidying up and left the house in a spotless condition. Pete arrived on time and worked very hard throughout the day. He overcame any problems to give us a much bigger loft access. We are very pleased with the results. Thanks. The job was done within two days as quoted. It was a big job and Peter worked very hard throughout the period. I now have easy access to my roof space for storage. To be recommended. Thank you so much for an excellent job. Can’t think why we didn’t do it years ago! Reliable, punctual and professional workmanship that will make access to our loft safe and easy now. Would recommend without hesitation. Basingstoke customer. Loft ladder , loft hatch . We are very pleased with the quality of the product provided and the service received. Mr and Mrs Miller, Winchester. Loft ladder, Loft hatch, Loft boarding. We have been very impressed with the professional approach from our initial inquiry to the completion of the work. The standard of work was very high and Pete was extremely courteous. We would thoroughly recommend him to anyone considering enhancing access to their loft space. Winchester customer. Loft board, Loft shelf. Fantastic job. We now have the perfect storage solution. Pete was very professional throughout the whole process. Thank you. Welcome to Access4Lofts North Hampshire. My name is Pete and I’m your North Hampshire based loft ladder installation expert. I can help you utilise your loft space by providing quick, easy and affordable loft access and storage solutions. I cover the areas of Andover, Basingstoke, Winchester and the surrounding areas. I offer a free quotation service with no high pressure sales and better still I don’t blind you with science or give you an approximate price and then add on extras – all my quotes are followed up in writing the very next day and I put a minimum of 5 year guarantee on all my work! And, for added peace of mind I am also accredited by the Which? Trusted Trader Scheme.